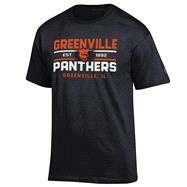 90% Cotton/ 10% Polyester, short sleeve t-shirt. 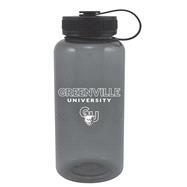 Features an arched design of 'Greenville University' over a school logo. 65% Polyester/ 35% Cotton, vintage sheer short sleeve t-shirt. 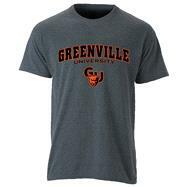 Features an arched design of 'Greenville University' over a school logo. 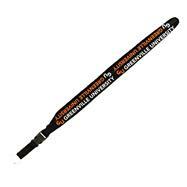 Woven 3/4" lanyard with fine weave graphic on both sides. Removable split ring. 34 oz. Classic tritan sport bottle in smoke. Features school name and school logo on the bottle. 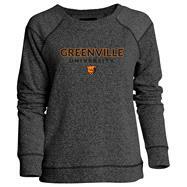 50% Cotton/ 50% Polyester, jersey long sleeve t-shirt with Greenville University Panthers logo screenprinted across the front chest. 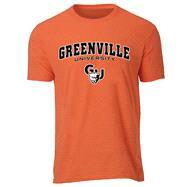 100% Cotton, jersey short sleeve t-shirt with Greenville University Panthers logo screenprinted across the front chest. 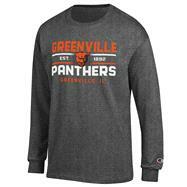 65% Cotton/ 35% Polyester, contrast sweater knit terry with reversed out fabric on shoulders. 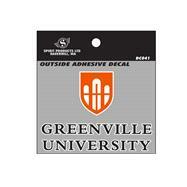 Features 'Greenville University' over a mascot logo. 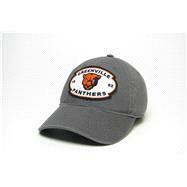 100% Cotton, washed twill hat with unstructured low profile fit, adjustable fabric strap , and antique brass slide buckle. 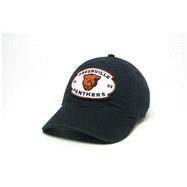 Features Greenville Panther's logo.